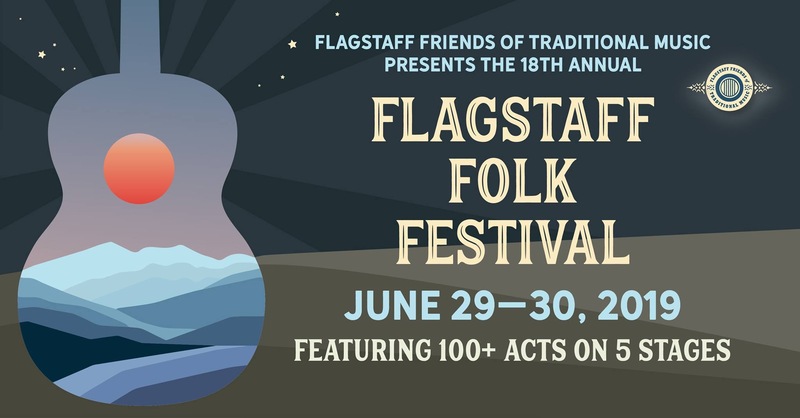 The Flagstaff Folk Festival welcomes all types of folk and acoustic music and musicians. This is not a strictly “bluegrass” or “old-time” or any other kind of event, and we are proud of it! We strive to offer our performers the best audiences on the best stages they will find anywhere in the Southwest. Our goal is to offer a venue for both seasoned and up-and-coming performers, and we do our best to schedule all those who wish to perform. Slots are filled on a first come, first-served basis, though we do our best to not turn anyone away. Bands will play on either an indoor or covered outdoor stage with sound reinforcement provided. Solo artists will either play acoustically on an intimate indoor stage in the Coconino Center for the Arts main gallery or a sheltered outdoor stage with sound reinforcement. Band sets are typically 35 minutes and solo sets 25 minutes. There is no monetary compensation for performers but we hope that is made up for by the exposure and camaraderie of the festival. Last year we had as many as 1500 attendees and close to 150 musicians from around the southwest. Of course performers are welcome to sell recordings at their performances and at the volunteer-staffed CD table (we take no commission on sales). Our festival is entirely volunteer-run and the modest ticket revenue is used for subsequent years’ events. You can access the 2019 musician signup form here.